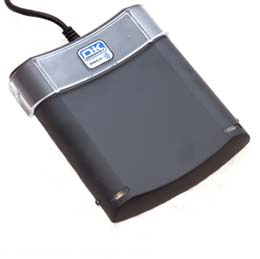 The Omnikey 5325 CL Prox from HID is a USB 2.0 PC-linked contactless smartcard reader that reads the unique serial number from HID Proximity cards (125 KHz). Designed to facilitate ease-of-use, this reader works with your existing HID Prox cards enabling implementation of new logical access applications without re-badging. The Omnikey 5325 CL enables easy integration with HID on the Desktop and other applications. The housing design is optimized for advanced user convenience in contactless applications, and includes a transparent holder for keeping cards in place as well as a long USB cable for increased convenience. The Omnikey 5325 CL Prox is compatible with Read-a-Card, the contactless card ID reading application, useful for the integration of RFID technology into new or existing systems.